The flashing question mark is your Mac's way of telling you that it's having trouble finding a bootable operating system. Normally, your Mac will start the boot process fast enough that you'll never notice the flashing question mark on the display. But sometimes you may find your Mac displaying the question mark icon, either for a short time before finally finishing the startup process or it may appear stuck on the question mark, waiting for your help. While the question mark is flashing, your Mac is checking all available disks for an operating system it can use. If it finds one, your Mac will finish booting. From the information in your question, it sounds like your Mac does eventually find a disk it can use as the startup drive and finishes the boot process. You can shorten, well, actually eliminate, the search process by selecting a startup disk in System Preferences. Click the Startup Disk preference pane in the System section of the System Preferences. A list of drives that are currently connected to your Mac and have OS X, macOS, or another bootable operating system installed on them will be displayed. Click on the padlock icon in the bottom left corner, then provide your administrator's password. From the list of available drives, select the one you wish to use as your Startup Disk. You'll need to restart your Mac for the change to take effect. 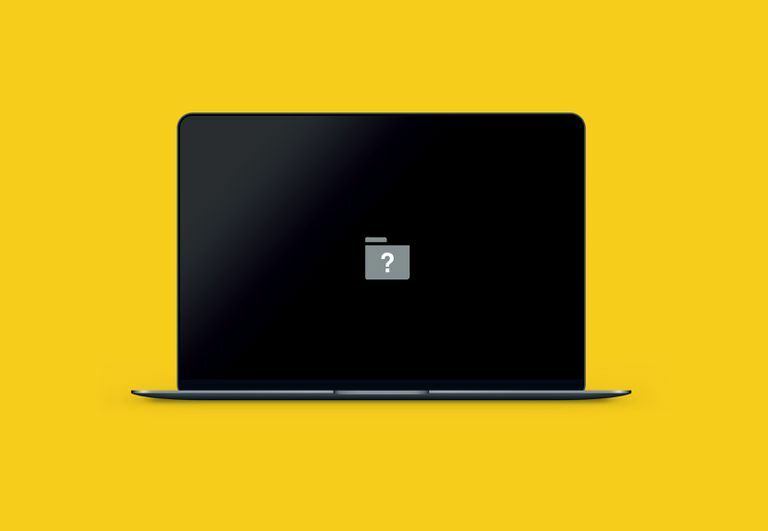 If the next time you start up your Mac the flashing question mark doesn't go away, and your Mac doesn't finish booting, you may have a more serious problem than a difficult-to-find operating system. Chances are your selected startup drive is having issues, possibly disk errors that may be preventing the necessary startup data from properly loading. But before you try the Safe Boot option, go back and check the Startup Disk you selected in the previous step. Make sure it's the same one that your Mac is actually using once it finally boots up. You can discover which volume is being used as the Startup Disk by using Disk Utility, an app included with the Mac OS. Disk Utility displays the Mount Point of every volume attached to your Mac. The startup drive's mount point is always "/"; that’s the forward slash character without the quote marks. The forward slash is used to indicate the root or starting point of the Mac's hierarchical file system. The startup drive is always the root or start of the file system in the Mac OS. In the Disk Utility Sidebar, select a volume, and then check the Mount Point listed in the volume information area in the bottom center of the window. If you see the forward slash symbol, that volume is being used as the startup drive. When a volume is not the startup drive, its mount point is usually listed as /Volumes/(volume name), where (volume name) is the name of the selected volume. Continue selecting volumes in the Disk Utility sidebar until you find the startup volume. Now that you know which volume is being used as the startup disk, you can return to the Startup Disk preference pane and set the correct volume as the startup disk. Safe Boot is a special startup method that forces your Mac to load only the minimum information it needs to run. Safe Boot also checks the startup drive for disk issues and attempts to repair any problems it encounters. You can find information about using the Safe Boot option in the How to Use Your Mac's Safe Boot Option article. Give Safe Boot a try. Once your Mac has booted using Safe Boot, go ahead and restart your Mac to see if the original question mark issue has been resolved. If you continue to have problems with getting your Mac to boot up properly, you should check these troubleshooting guides for assistance with Mac startup issues. If you're still having startup issues, try starting from another device. If you have a recent backup/clone of your startup drive, try booting from the bootable backup. Remember, Time Machine doesn't produce backups you can boot from. You would need to have used an app that can create clones, such as Carbon Copy Cloner, SuperDuper, Disk Utility's Restore function (OS X Yosemite and earlier), or Use Disk Utility to Clone a Mac's Drive (OS X El Capitan and later). You can use the Mac’s OS X Startup Shortcuts to pick a different drive to temporarily boot from. If you can start your Mac up from a different drive, you may need to repair or replace your original startup drive. There are a number of apps that can repair minor disk problems, including Disk Utility's First Aid feature and Drive Genius. You can also use another special startup mode called Single User Mode to perform disk repair on the startup drive.